Even if you aren't a pastry-maker, you can make this homey pot pie recipe thanks to frozen phyllo dough. 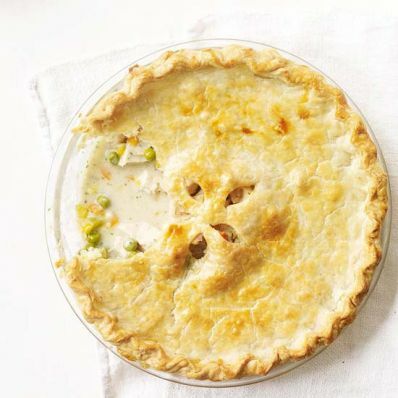 Once you spoon into the golden flaky crust, you'll find a creamy chicken filling complete with potatoes, carrots, and green beans. 1 of 6 Heat oven to 350 degrees F. Coat a 3-quart baking dish with nonstick cooking spray. 2 of 6 Heat 2 teaspoons of the oil in a large nonstick skillet over medium-high heat. Season chicken with 1/4 teaspoon of the salt and 1/4 teaspoon of the pepper. Cook 8 minutes, turning halfway through cooking time. Transfer to a plate. 3 of 6 Add remaining oil, onion and celery; cook 3 minutes. Stir in garlic and flour and cook, stirring constantly, 1 minute. Gradually stir in broth and milk. Cook, stirring, until mixture comes to a boil. 4 of 6 Add potatoes, carrots, green beans, remaining salt and pepper. Cover; cook on medium-low, stirring occasionally, 10 minutes. Stir in chicken, parsley and sage. Spoon into prepared baking dish. 5 of 6 Unroll phyllo. Place 1 sheet on top of chicken mixture; lightly coat with cooking spray. Sprinkle with 1 tablespoon of the cheese. Repeat layering. Tuck edges of phyllo inside rim of baking dish. 6 of 6 Place baking dish on a baking sheet; bake at 350 degrees F for 35 to 40 minutes or until filling is bubbly. Let stand 10 minutes. Per Serving: 3 g fiber, 35 g pro., 341 kcal cal., 711 mg sodium, 2 g sat. fat, 75 mg chol., 8 g Fat, total, 32 g carb.